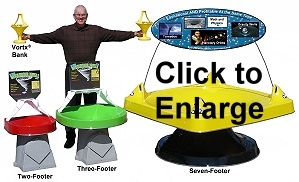 "The most profitable fund raising devices of all time!" Welcome to our website. 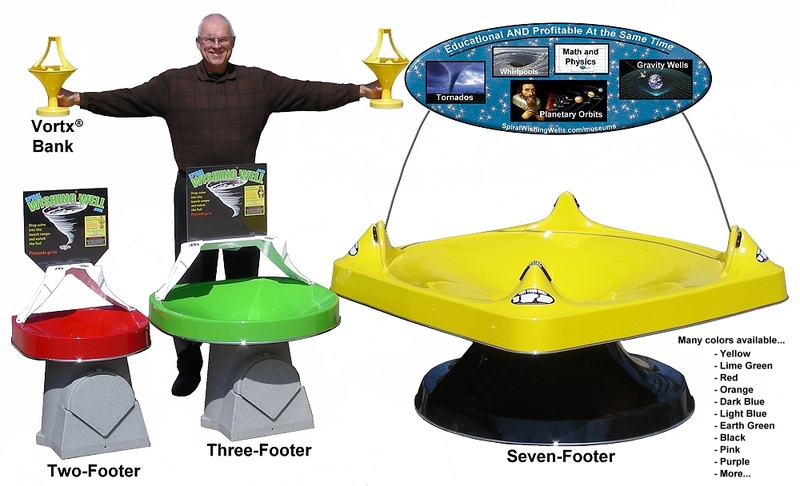 It has been our privilege to invent, patent, manufacture, and ship Spiral Wishing Well Coin Vortex Funnels all over the world for over 25-years. 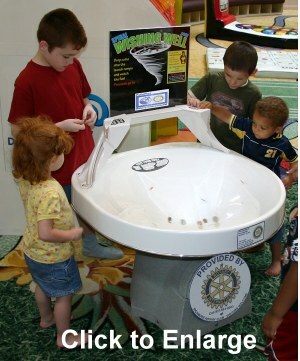 Over $1 billion worth of coins have been tossed into these coin funnels for every imaginable type of charity. 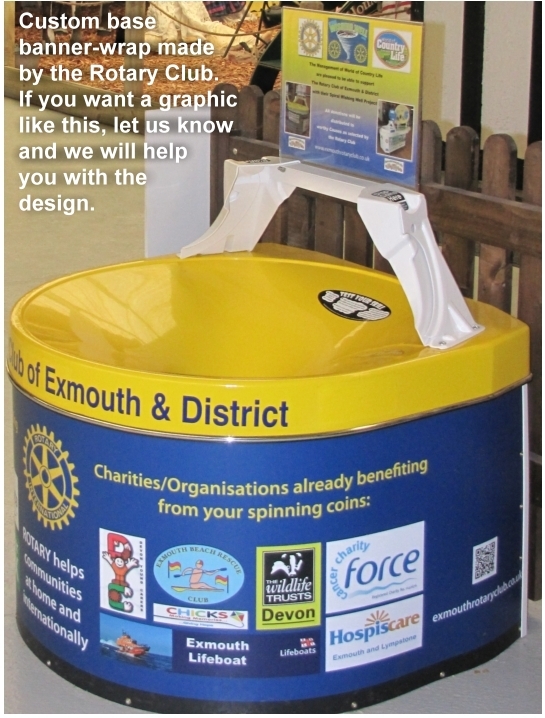 Spiral Wishing Wells not only raise money, they act as a "billboard" promoting your charity or project. 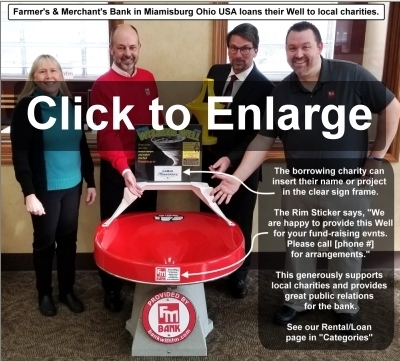 This is a great way to get the word out in your community and attracting volunteers and larger financial support. 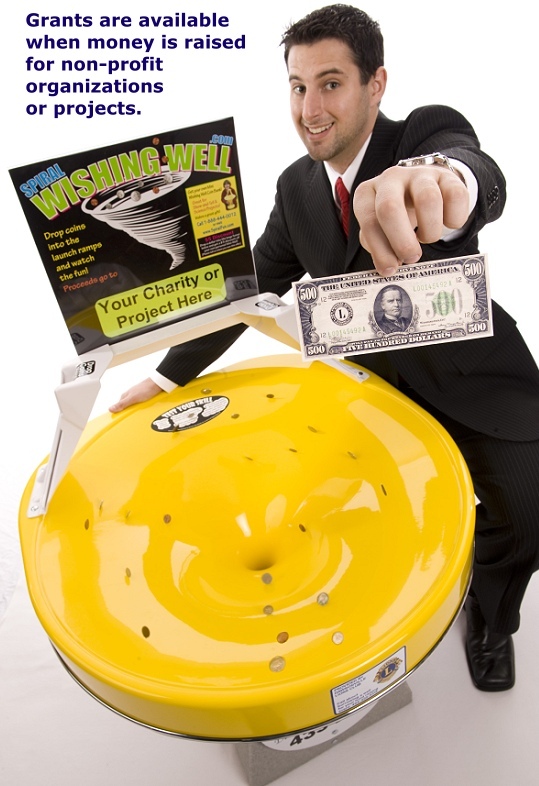 In these tough economic times, as other forms of donations and funding shrink, more and more organizations are turning to Spiral Wishing Wells as a creative way to increase their income. There is an estimated $10 billion worth of coins in the homes of America, and many times that throughout the world. Many homes have over $50 of coins in jars or bottles...just waiting for an invitation to donate them to charity in their Wishing Well. 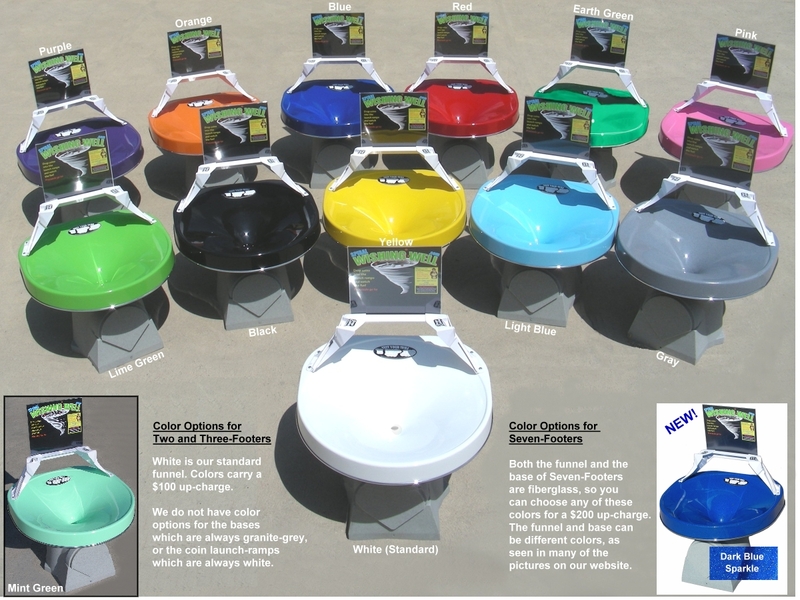 We have just completed development of several brand new patented innovations including coin launch ramps OUTSIDE the funnel which produce larger spirals and don't block the view of the coins. 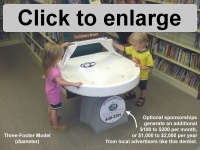 We have also introduced a giant Seven-Footer model with eight coin-launch ramps. 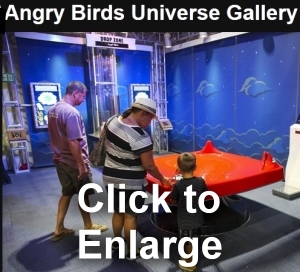 It presents a stunning visual show, and the play-attraction is extraordinary. 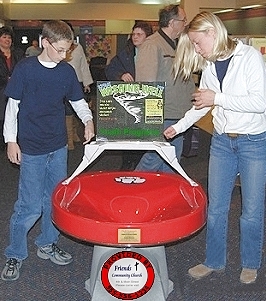 Children and adults can play racing games and experiment to see if they have the skill to toss coins in without using the launch ramps. These innovations have increased revenue even greater than past models. 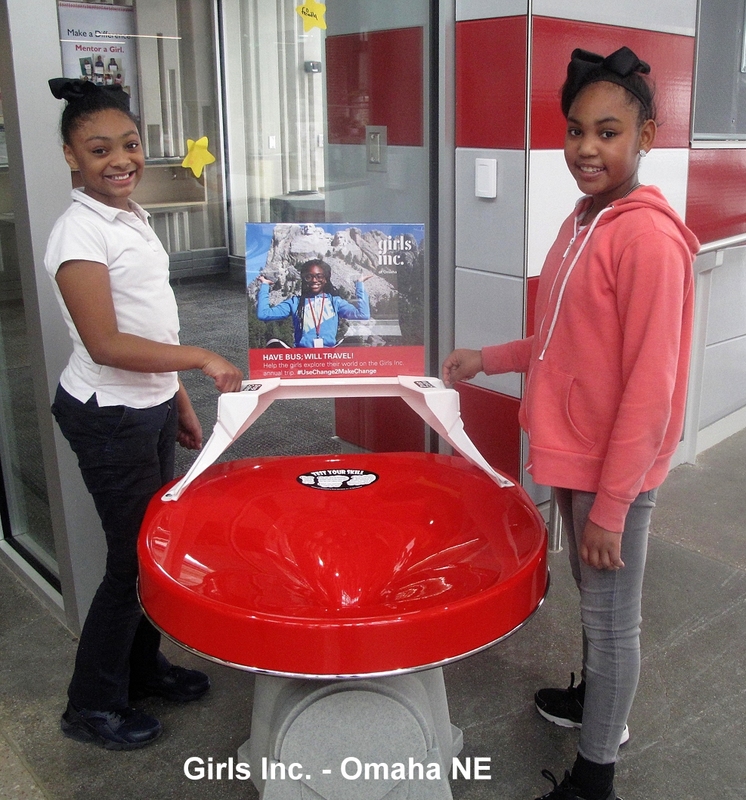 We are very excited to announce that ProjectKindness.org is providing grants again this year that pay a significant portion of the cost of the Wells for non-profit use. 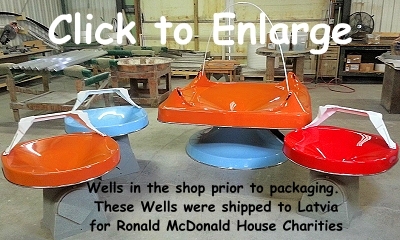 So if you are a charity, non-profit organization, or if you are a store or other entity purchasing Wells to raise money for a non-profit organization or project, they will cover part of the cost. This is discussed more fully on the Prices page. 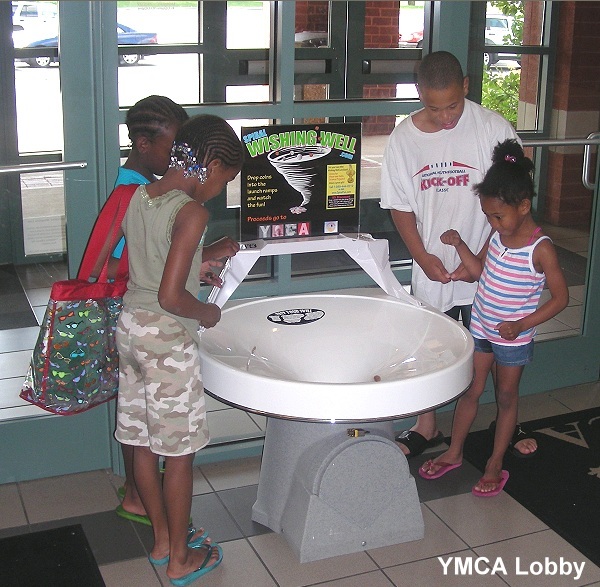 Why do people of all ages toss so much money into these Wells? People love to watch coins spin around in circles at eye-blurring speeds seeming to defy the laws of gravity as they descend the nearly vertical walls of the vortex funnel. 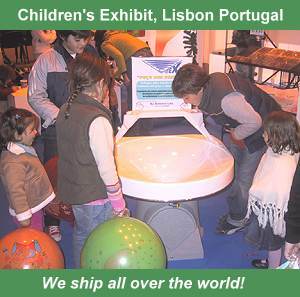 It is all about the fascination and fun. 100% of the revenue goes to the listed charity. We never receive any splits or share of the money people toss in. Click on the accompanying picture to view an exciting clip from Japan. The current one day income record in Japan is 75,501 yen! (US$686.37) The one-day record in the United States is $40,979 using our event strategies. 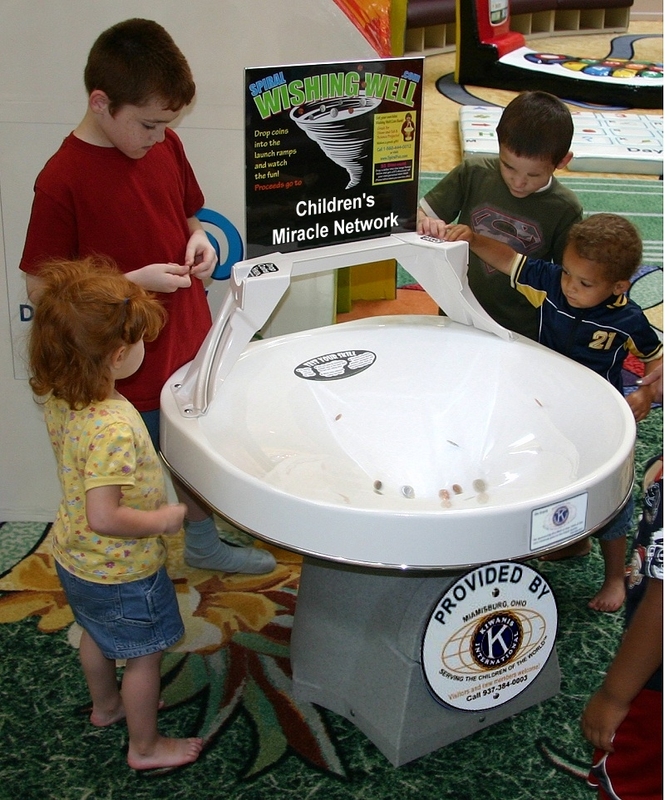 Notice the wide spirals of the coins, using the entire funnel since the ramps are mounted "outside" the surface. 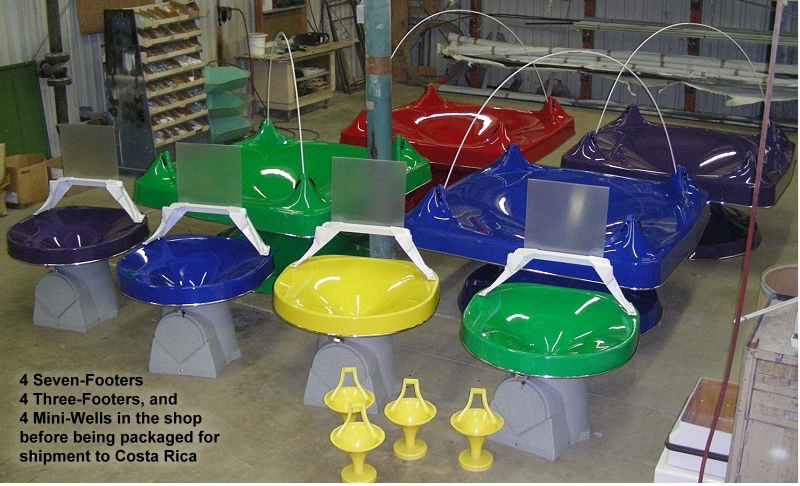 This is one of the features of our new models. 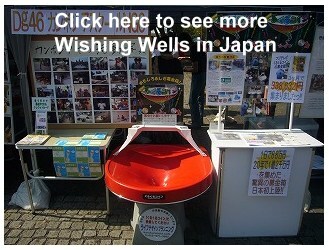 The following paragraphs and pages describe why Spiral Wishing Well Coin Funnels are so profitable and popular. 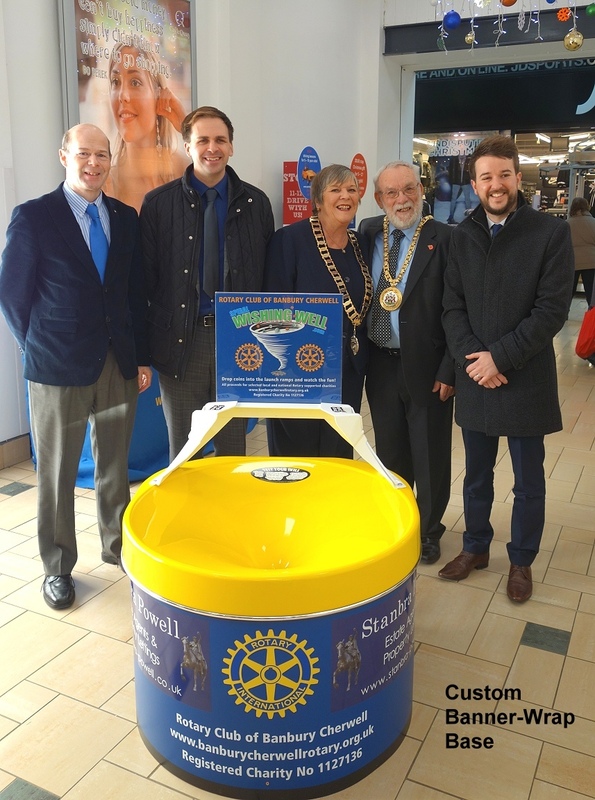 They generate LOTS more money than static donation boxes. 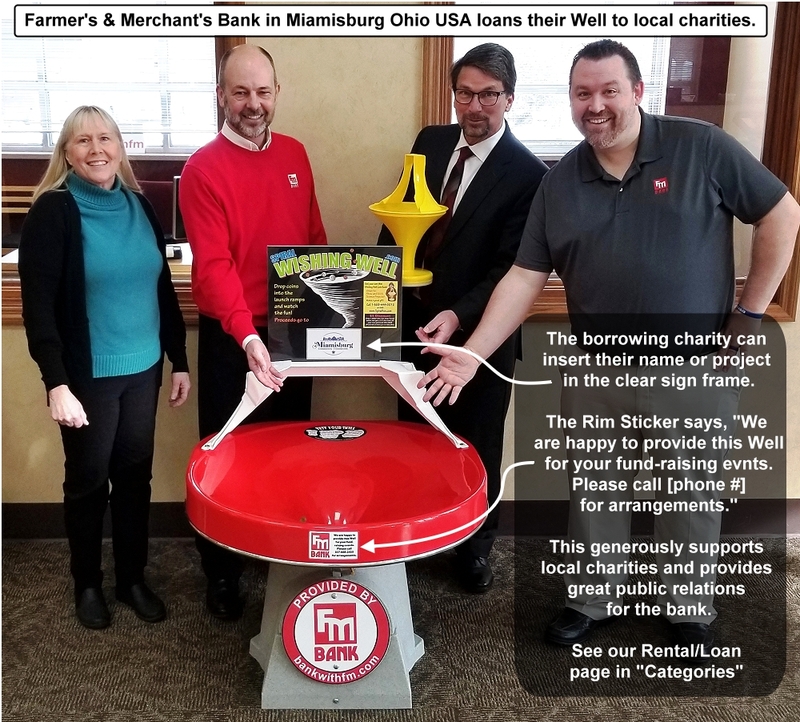 If you are a charity or a store raising money for a charity, we present to you the simplest, most profitable fund-raising device of all time, and will show you how you can get yours completely paid for before the first coin is tossed in! The current one-day record for a single Well is $40,979.37 at a church in Loma Linda California. 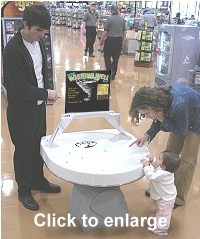 Click here to read how they did it. The one-day record at a school is $7,352. 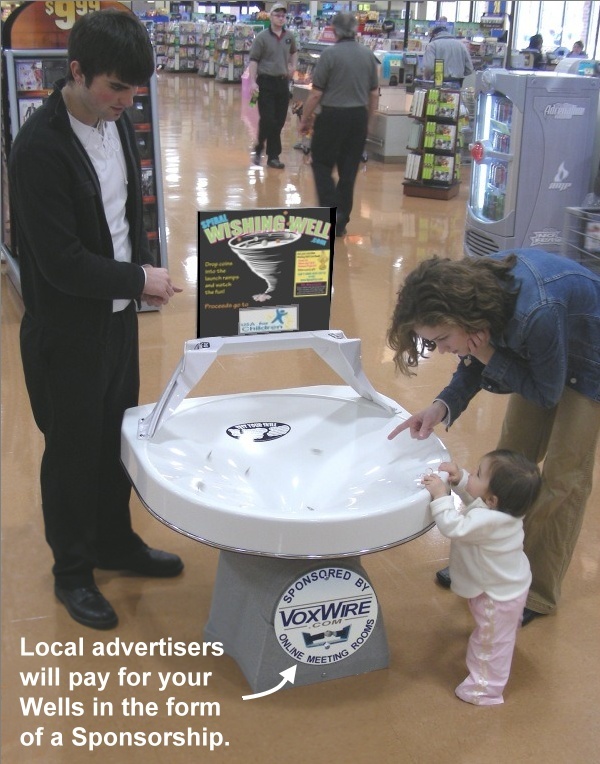 A Wishing Well is like a "bill-board" promoting your organization INSIDE retail locations which are the most valuable advertising spaces in the city. This gives valuable exposure to your cause, attracts volunteers and donors, and is often more valuable than the coin revenue itself. 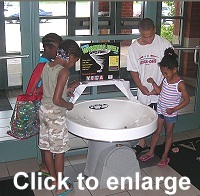 Many gravity wells have generated over $100 a day with only a little promotion. 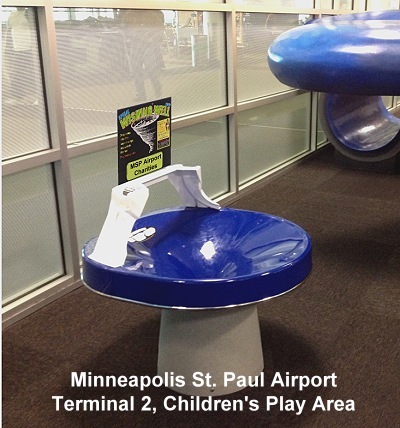 Several have brought in over $100,000 in the same location for several years. The Air Force Museum in Dayton Ohio has had over $2 million worth of coins tossed in during its life so far! Those are great locations. 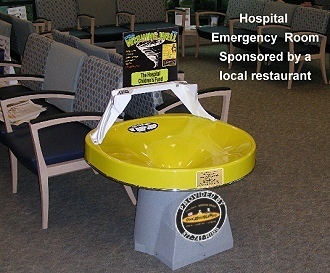 But even ordinary locations can effortlessly generate $100 to $500 per month and easily out-perform a static donation box. 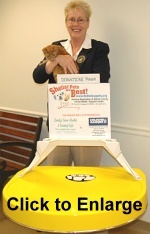 Click here to read how a pediatric office (pictured here) raises $350 to $1,000 per week in their waiting room. 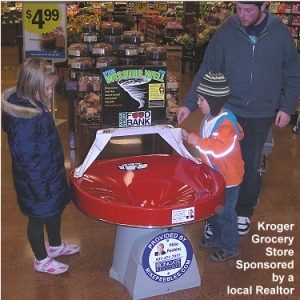 If you have a good foot-traffic location with lots of children, you can copy their strategy. 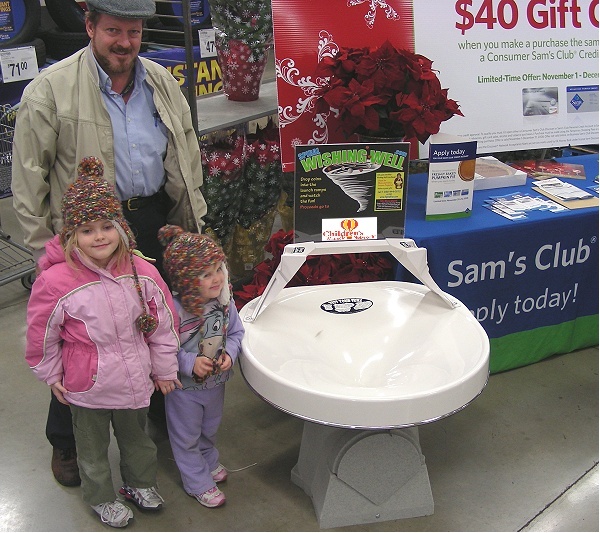 The Children's Hospital in Albuquerque New Mexico has placed 32 Spiral Wishing Wells in Wal-Mart and Sam's stores throughout the State. 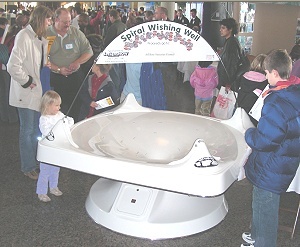 If you represent a regional or national chain of stores, charity, or other organization, we will help you put together a Spiral Wishing Well program that includes funding, custom signs, and promotions that will bring extraordinary results. With government subsidies to charities being reduced, and proposals to eliminate the charitable tax deduction now being debated by politicians, competition for public money is increasing dramatically. 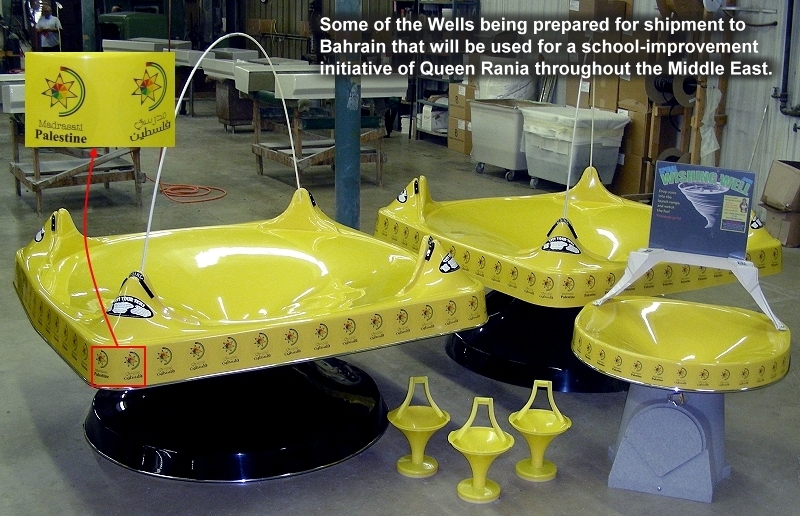 Our Wells are uniquely qualified to fill that need---immediately! 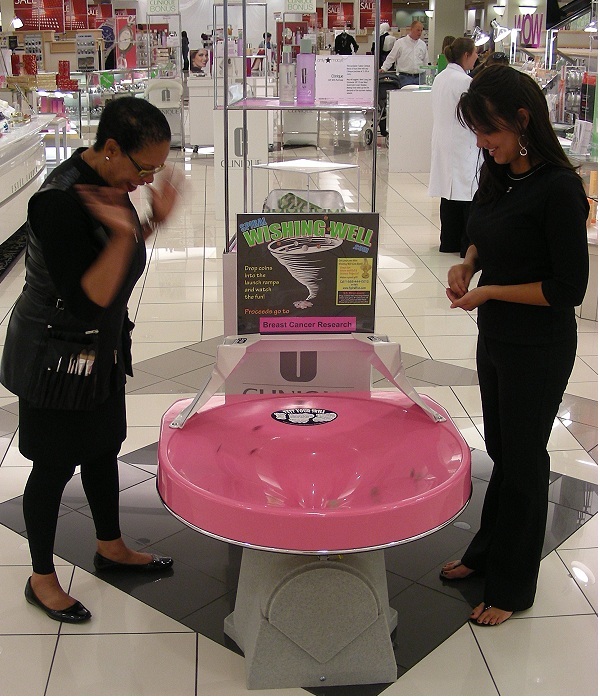 Spiral Wishing Wells give something back to the customer---FUN, FUN, FUN! 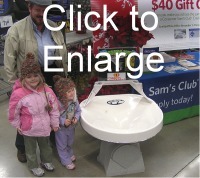 Your customers are not being solicited, a critical point that all stores value. 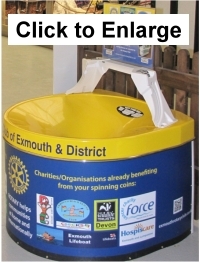 Great for service clubs. It not only raises a lot of money for your projects, it publishes your name in the community and attracts more members! Spiral Wishing Wells do not require valuable employee time like most corporate fund raising programs. 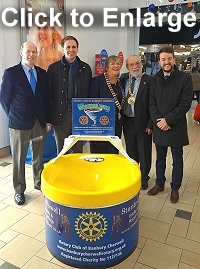 Stores and charities can own and control their Spiral Wishing Wells outright so that 100% of the revenue goes to the charity and no splits with a vending machine operator. 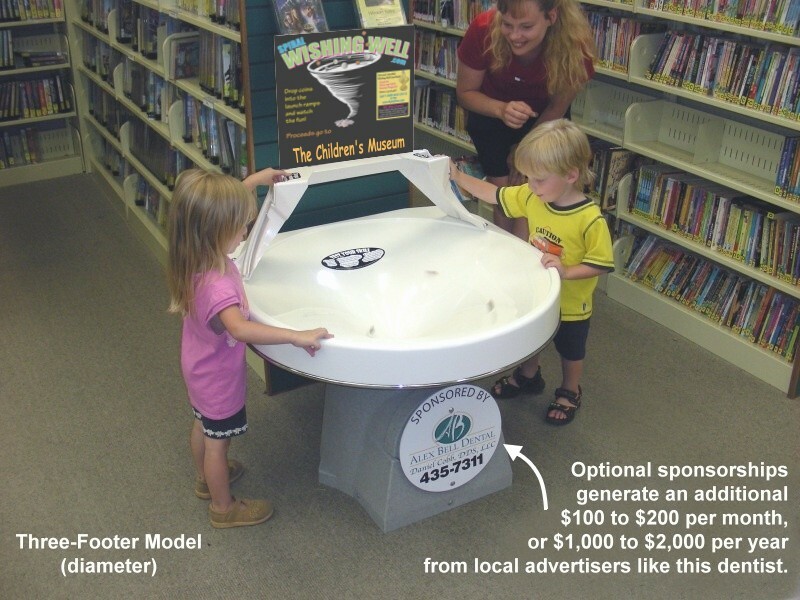 Some stores use a Spiral Wishing Well as their "official" fund-raising method and avoid the pressure from the dozens of charities who want to solicit their customers. 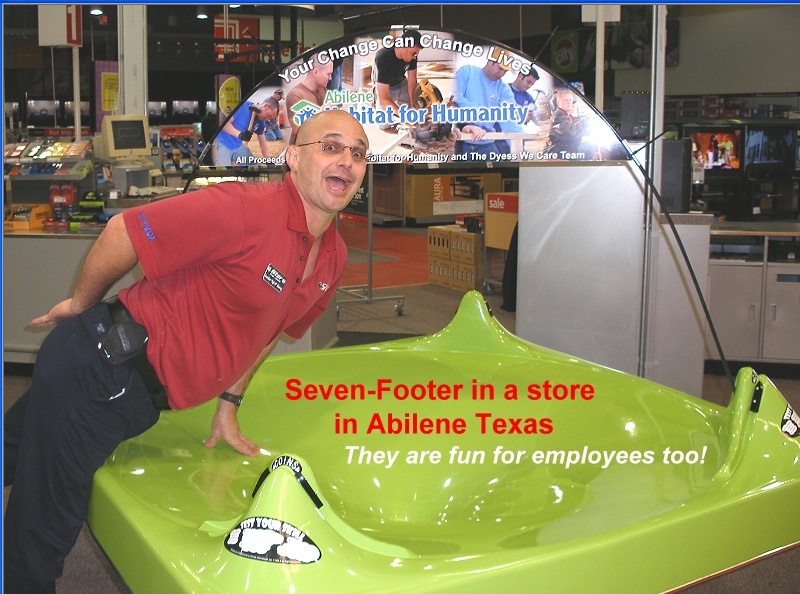 Prime locations include restaurants, department and grocery stores, children's toy and clothing stores, museums and zoos, libraries, malls, movie theaters, bowling lanes, and every other location with walk-in customers or visitors. 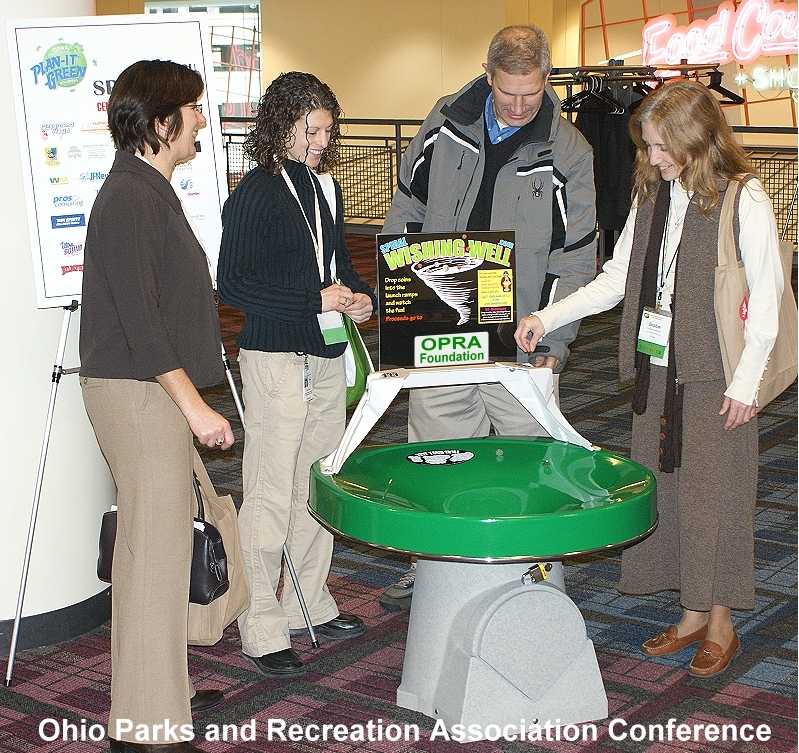 We even have Spiral Wishing Wells in major-league ball parks and on ferry ships. 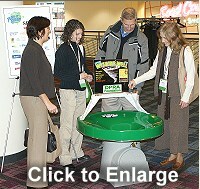 Wherever there are people, Spiral Wishing Wells will lighten their load as they unload their pockets and purses. 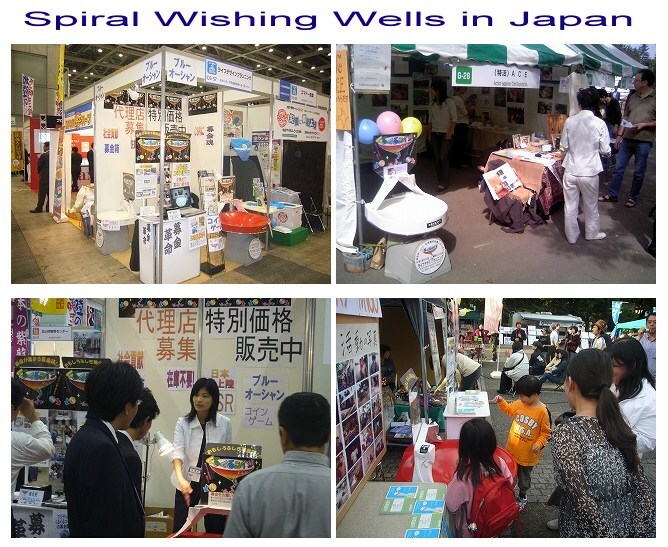 Spiral Wishing Wells have raised thousands of dollars at one-day events and short-term campaigns. For instance, high school kids in Oregon helped raise $248,000 in 45 days which paid for a life saving bone morrow transplant for one of their fellow-students. 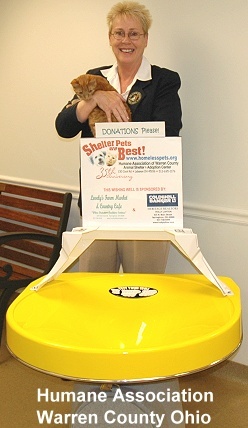 The surplus was matched with other funds, providing transplants for 11 more children! 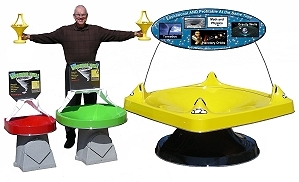 I had no idea back in 1985 when I built the first coin-spinning funnel as an offering device for the children in my church that it would become a global phenomenon that would raise millions of dollars per year for charities...over $1 billion so far. What a ride it has been. 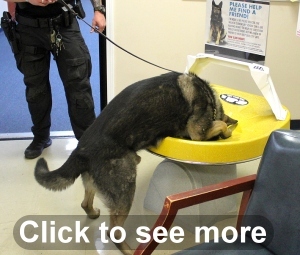 Admittedly, there is a LOT of information in this website. 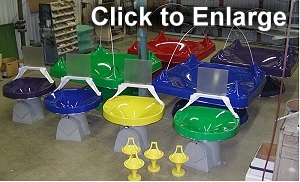 There are several different "categories" of customers who need information specific to their application. 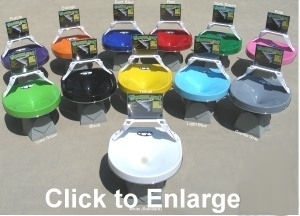 It is best viewed on desktop computers, but it is also mobile friendly. After you have reviewed the website, contact us to find out what grants are available at this time for non-profit fund raising usage. at Dyess Air Force Base in Texas. 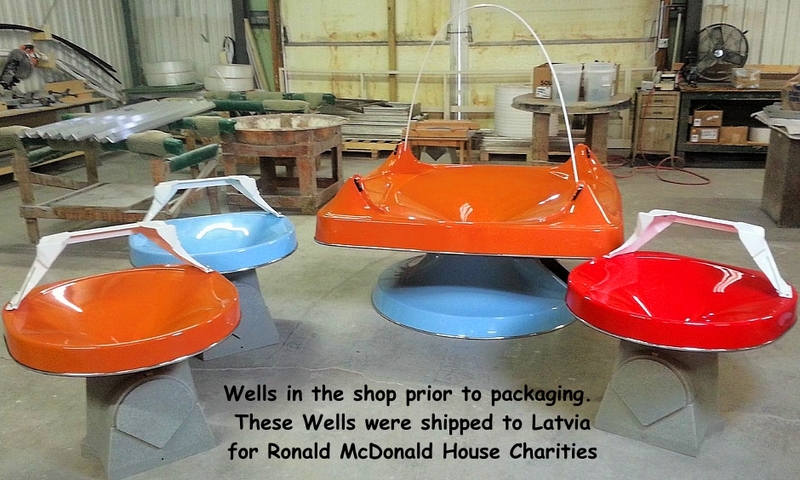 A large portion of our business is providing Wells internationally. By buying directly from our factory, you can save the mark-up of a local reseller who would also pass on the same shipping cost. With today's easy communication, payment, and shipping options, combined with our ever-ready inventory, it is our pleasure to serve international customers with the same speed and service as those in the USA. Click here to read more about international options. 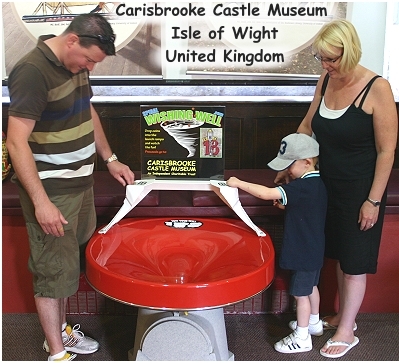 "Just to let you know that the Wishing Well has arrived safely in less than a week, and we put it into immediate operation. longer and are not as smooth as your service!!!!"